Welcome to the Chabad Cayman Jewish Community. 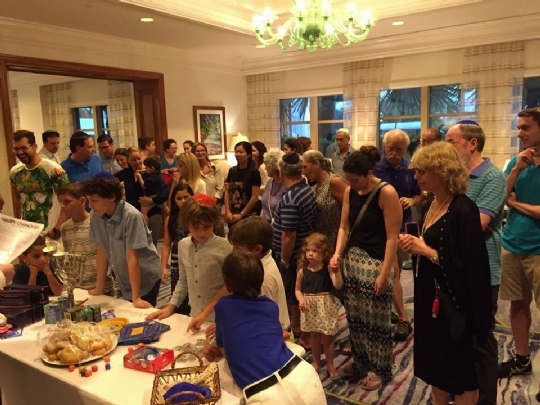 A Growing and Vibrant Jewish community in the Cayman Islands. We aim to promote and strengthen Jewish awareness, pride and observance in the Cayman Islands. We strive to reach out to every Jew by providing a wide variety of educational, religious, and social services, our emphasis is on sharing the treasures of our tradition and affording every Jew the opportunity to experience his or her wonderful Jewish heritage. Additionally we serve as the go to address for all the Jewish needs travelers and visitors to Cayman may require. We are fortunate to now have 2 locations: The Beit Hillel Chabad House and the New Cayman Jewish Community Center at 7 Mile Shops. We are proud to offer Educational services for all ages, weekly Shabbat and Festival synagogue services. Social Gatherings, Public Lectures and Cultural events, as well as Jewish holiday celebrations where everyone is welcome regardless of background or level of religious observance. We look forward to welcoming you to our lovely community and to your participation in the Cayman Jewish Community programs.